How’s this for true love? In an idyllic winter setting, she glides smoothly toward him, accelerating with every stride as she draws closer. But then with barely a touch, he sprints away on the cold, crisp powder in the opposite direction, never looking back or lingering in the winter wonderland. He is gone! 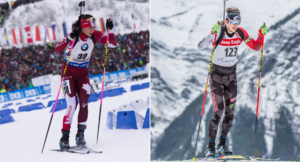 For Shaklee Pure Performance Team members Rosanna Crawford and Brendan Green, biathletes representing Canada, that sprinting routine is indeed their beautiful commingling of sport, life, and love. In their last two Games, Rosanna and Brendan competed in the Biathlon Mixed Team Relay as teammates, and in PyeongChang, they were teammates engaged to be married. Talk about team unity! Rosanna and Brendan met on the competition circuit as teenagers and began dating in 2009. As you might guess, they had no problem finding common interests, especially since they trained and competed together in the Biathlon 11 months of the year. How do they manage it all? We asked a few questions of the fast-skiing, straight-shooting couple. Q: What was it like competing in the same Games on the same team in the same event? Rosanna: It is always such an honor to represent your country together on the world stage. Getting to compete together in the Mixed Relay at the past two Games was really cool! Brendan: These Games included a lot of special memories; for sure, getting to race in the Mixed Relay with Rosanna is high on that list. I don’t think many couples can say that they have been to the Games together, let alone competed as a team in the same race together! Q: How have you helped each other become better competitors? Rosanna: It’s been great being on this journey together because we both understand the demands of our sport, such as the need to go to bed at 9:00 pm and that we can’t go out on the weekend! We’ve been there for the highs and the lows and know what the other needs. We are also on the road a lot and away from family and friends, so having each other makes the time away from home a lot easier. Brendan: I think we add balance to each other’s lives. We train together, travel together, race on the same circuit, and spend almost all our time together. At the end of the day though, we’re still different people, which I think is why we click. I’m a very focused individual when it comes to training and racing, almost too much so. I can spend an entire day absorbed in biathlon trying to better myself at the sport, but that’s not necessarily a healthy approach. Rosanna helps keep things in perspective for me and helps me realize that there is more to life than sport. On the other hand, I think I’ve helped Rosanna bring the right amount of focus and attention needed to excel in elite-level sport. Q: What can you tell us about your sport that would surprise us? Rosanna: A lot of people think that biathletes are Zen masters and can lower their heart rate as they shoot, but really, it’s all about your breathing. Of course, your heart rate naturally slows as you enter the shooting range and stop to shoot, but only about 10 beats or so. While shooting you inhale, exhale halfway out, hold your breath, then take the shot—and repeat this process five times for hopefully five hits! Brendan: Hmmm. Many people are shocked by how much we race in a winter. Our season consists of nine World Cup stops plus World Championships every year. This adds up to 34 World Cup races from the middle of November to the end of March. We often compete in other races throughout the winter as well. People also find it interesting how much we train. The month of April is our only downtime away from biathlon, but we still stay active, just not with structured training. From the beginning of May to the end of March, we are racing and training full time with the Canadian National Team. Q: Can either of you tell me something interesting, inspiring, or even funny? Rosanna: Brendan had two spinal surgeries in 2012. I would come over and make his breakfast in the morning, usually a smoothie in a mixer he could blend when he woke up. One day I accidentally put in too much cinnamon, so Brendan experienced the “cinnamon challenge” fad without even trying! Q: Any motivational thoughts for the Shaklee Community? Rosanna: Focus on the process; wishing and hoping for a podium isn’t what’s going to get you there. Focus on what you can control. And, thank you! I cannot say it enough—without all the incredible people in our life, there is no way Brendan and I would have been able to represent Canada at our third Games. Brendan: I joined team Shaklee in 2018 in the months leading up to the Games in PyeongChang. I can honestly say that Shaklee goes above and beyond to take the utmost care of their athletes so that they can perform to their full potential. Whether it’s last minute nutritional needs or some extra motivation before a race, Shaklee was there. I am proud to be an ambassador for a company that truly cares about its athletes in such a professional and kindhearted manner. A huge thank you to the Shaklee Family for the well wishes and amazing support, and for welcoming me to the team with open arms. I look forward to what the future brings!